Institutes of the Christian Religion (Latin: Institutio Christianae Religionis) is John Calvin‘s seminal work of Protestant systematic theology. Highly influential in the Western world and still widely read by theological students today, it was published in Latin in 1536 (at the same time as Henry VIII of England‘s Dissolution of the Monasteries) and in his native French language in 1541, with the definitive editions appearing in 1559 (Latin) and in 1560 (French). The book was written as an introductory textbook on the Protestant creed for those with some previous knowledge of theology and covered a broad range of theological topics from the doctrines of church and sacraments to justification by faith alone and Christian liberty. It vigorously attacked the teachings of those Calvin considered unorthodox, particularly Roman Catholicism, to which Calvin says he had been „strongly devoted” before his conversion to Protestantism. John Calvin was a student of law and then classics at the University of Paris. Around 1533 he became involved in religious controversies and converted to Protestantism, a new Christian reform movement which was persecuted by the Catholic Church in France, forcing him to go into hiding. He moved to Basel, Switzerland, for safety in 1535, and around this time he must have begun writing a summary of theology which would become the Institutes. His Catholic opponents sought to tie him and his associates (known as Huguenots in France) to groups of radical Anabaptists, some of which had been put down by persecution. He decided to adapt the work he had been writing to the purpose of defending Protestants suffering from persecution from false accusations that they were espousing radical and heretical doctrines. The work, written in Latin, was published in Basel in March 1536 with a preface addressed to King Francis I of France, entreating him to give the Protestants a hearing rather than continue to persecute them. It is six chapters long, covering the basics of Christian creed using the familiar catechetical structure of the Ten Commandments, the Apostles’ Creed, the Lord’s Prayer, and the sacraments, as well as a chapter on Christian liberty and political theology. Soon after publishing it, Calvin began his ministry in Geneva, Switzerland. The Institutes proved instantly popular, with many asking for a revised edition. In 1539, Calvin published a much larger work, with seventeen chapters of about the same length as the six chapters of the first edition. It includes many references to classical authors and Church fathers, as well as many additional references to the Bible. Calvin’s epistle to the reader indicates that the new work is intended for theological students preparing for ministry. Four chapters were added in a third edition in 1543, and a 1550 edition was published with only minor changes. The fifth and final edition with which Calvin was involved, and which is used by scholars as the authoritative text, is 80% larger than the previous edition and was published in Geneva in 1559. Calvin’s theology did not change substantially throughout his life, and so while he expanded and added to the Institutes, he did not change their main ideas. The Latin word „institutio„, translated in the title as „institutes”, may also be translated „instruction”, as it was in titles of German translations of the work, and was commonly used in the titles of legal works as well as other summary works covering a large body of knowledge. 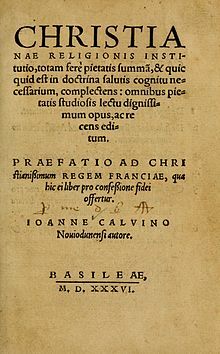 The title of Desiderius Erasmus‘s Institutio principis Christiani (1516), which Calvin would have been familiar with, is usually translated The Education of a Christian Prince. The form of the short title of the first edition of Calvin’s work, published in 1536 is Christianae religionis institutio. The full title of this edition may be translated The Institute of the Christian Religion, Containing almost the Whole Sum of Piety and Whatever It is Necessary to Know in the Doctrine of Salvation. A Work Very Well Worth Reading by All Persons Zealous for Piety, and Lately Published. A Preface to the Most Christian King of France, in Which this Book is Presented to Him as a Confession of Faith. Author, John Calvin, Of Noyon. Basel, MDXXXVI. In the 1539 edition, the title is Institutio Christianae Religionis, possibly to emphasize the fact that this is a new, considerably expanded work. This is followed by „at length truly corresponding to its title”, a play on the grandiosity of the title and an indication that the new work better lives up to the expectation created by such a title. Despite the dependence on earlier writers, Institutes was felt by many to be a new voice, and within a year there was demand for a second edition. This came in 1539, amplifying especially the treatment of the fall of man, of election, and of reprobation, as well as that of the authority of scripture. It showed also a more conciliatory temper toward Luther in the section on the Lord’s Supper. The opening chapter of the Institutes is perhaps the best known, in which Calvin presents the basic plan of the book. There are two general subjects to be examined: the creator and his creatures. Above all, the book concerns the knowledge of God the Creator, but „as it is in the creation of man that the divine perfections are best displayed”, there is also an examination of what can be known about humankind. After all, it is mankind’s knowledge of God and of what He requires of his creatures that is the primary issue of concern for a book of theology. In the first chapter, these two issues are considered together to show what God has to do with mankind (and other creatures) and, especially, how knowing God is connected with human knowledge. To pursue an explanation of the relationship between God and man, the edition of 1559, although Calvin claimed it to be „almost a new work”, in fact completely recast the old Institutes into four sections and 80 chapters, on the basis of the Apostles’ Creed, a traditional structure of Christian instruction used in Western Christianity. First, the knowledge of God is considered as knowledge of the Father, the creator, provider, and sustainer. Next, it is examined how the Son reveals the Father, since only God is able to reveal God. The third section of the Institutes describes the work of the Holy Spirit, who raised Christ from the dead, and who comes from the Father and the Son to affect a union in the Church through faith in Jesus Christ, with God, forever. And finally, the fourth section speaks of the Christian church, and how it is to live out the truths of God and Scriptures, particularly through the sacraments. This section also describes the functions and ministries of the church, how civil government relates to religious matters, and includes a lengthy discussion of the deficiencies of the papacy. There is some speculation that Calvin may have translated the first edition (1536) into French soon after its publication, but the earliest edition which has survived is Calvin’s 1541 translation.It was primarily intended for French-speaking Swiss, since very few copies were able to be smuggled into France. Some of these were publicly burned in front of Notre-Dame Cathedralsoon after their publication. Calvin published French editions of the Institutes in 1541, 1545, 1551, and 1560. They follow the expansion and development of the Latin editions, but they are not strictly translations, instead being adapted for use by a lay readership, though retaining the same doctrine. The Institutes were translated into many other European languages. A Spanish translation by Francisco de Enzinas of the 1536 Latin text was published in 1540, before Calvin even published his first French edition. 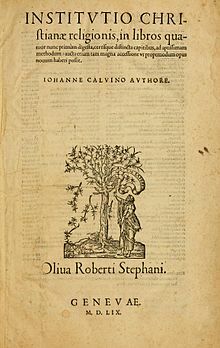 An Italian translation of Calvin’s French text was made in 1557. Later translations were of the final 1559 Latin text: Dutch (1560), German (1572), Spanish (1597), Czech (1617), Hungarian (1624), and Japanese (1934). Scholars speculate that the seventeenth-century orientalist Johann Heinrich Hottinger translated it into Arabic, but this has not been confirmed. A complete translation by HW Simpson of the 1559 Latin text into Afrikaans was published in four volumes between 1984 and 1992, following an earlier abridged translation by A Duvenhage in 1951. We are not our own; therefore neither our reason nor our will should predominate in our deliberations and actions. We are not our own; therefore let us not propose it as our end, to seek what may be expedient for us according to the flesh. We are not our on; therefore, let us, as far as possible, forget ourselves and all things that are ours. On the contrary, we are God’s; to him, therefore, let us live and die. Calvin’s first French edition (1541) has been translated by Elsie Anne McKee (2009). Due to the length of the Institutes, several abridged versions have been made. The most recent is by Tony Lane and Hilary Osborne; the text is their own alteration and abridgment of the Beveridge translation. The Institutes overshadowed the earlier Protestant theologies such as Melanchthon‘s Loci Communes and Zwingli‘s Commentary on the True and False Religion. According to historian Philip Schaff, it is a classic of theology at the level of Origen‘s On First Principles, Augustine‘s The City of God, Thomas Aquinas‘s Summa Theologica, and Schleiermacher‘s The Christian Faith.